Rendering of Placer Valley Sports Complex. As Elk Grove continues its deliberations on what sort of soccer-facility to build and how to finance it, a 10 to 12-field soccer facility is scheduled to break ground one year from now in Roseville. According to reporting by the Sacramento-based Comstock's magazine, groundbreaking on the facility is expected one year from now with an anticipated opening date in 2018. The $35 million facility is being built by the Placer Valley Sports Complex (PVT) and Tourism Marketing District and will be financed with bonds backed by $4.50 rising to $6.50 in 2017 per night transient room tax in Lincoln, Rocklin and Roseville. The facility is being designed by the award winning Sacramento-based LPA. 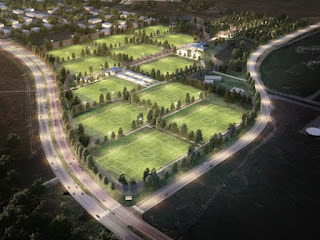 Specializing in sustainable design and architecture, Comstock's reports that LPA will design up to 12 soccer fields using drought-tolerant landscaping and artificial turf to reduce water use and lower operating costs. PVT, which operates under a joint operating agreement between the cities of Lincoln, Rocklin and Roseville, claims the area already hosts over 60,000 annual visitors who visit the three-city area for soccer and other athletic tournaments. Once in operation the facility open it is expected to generate 25,000 additional hotel nights in the area and have an annual economic impact of $8 to $12 million. Elk Grove is currently pursuing a similar facility with enhanced amenities like natural turf fields, a soccer stadium and an indoor training facility. Although the city purchased 99-acres outside current city limits, the city has not yet put its design and construction contracts out to bid and has not identified now the estimated cost of $47 million for the facility will be financed. Soccer lame. Waste of taxpayers dollars. I think our kids need some more soccer fields. We just need to drop the grandiose ideas that are so costly for the taxpayers. I like the idea of using drought-tolerant landscaping and artificial turf to reduce water use and lower operating costs. One reason being that with natural turf, fields will have to be rotated to allow for them to recover after some hard use. As to the estimated cost of $47 million for our facility....well you know how our "estimates" work out. Most likely $10 million off!